I wouldn’t go as far to say that these cookies came from a pregnancy cookie craving – because let’s be real I probably crave cookies a lot of the time. I think it came from too much Great British Bake Off re-runs or the new Nailed It show on Netflix (so cheesy and awful but also so good). But for real I have definitely been craving more carby types things this pregnancy and generally, have been doing a good job at keeping it under control ….and thankfully I have mainly been craving fruit (yes you previously pregnant mamas can hate me now). 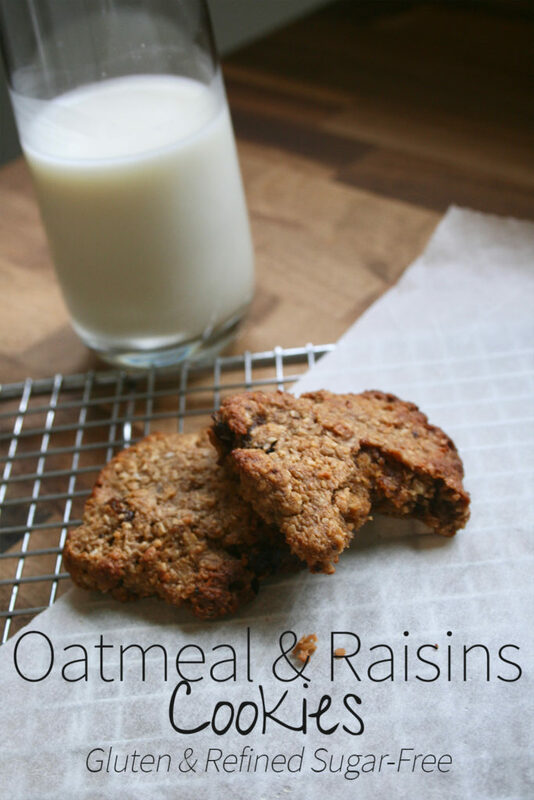 But on a recent evening when I was feeling particularly nausea and crap – Oatmeal and Raisin Cookies was the exact thing I needed. Chewy, comforting and, in this case, not full of refined sugars and contained some healthy fats. These are pretty sweet so I wouldn’t go so far to say they are a healthy everyday food but when you need a glass of almond milk and a cookie – then these are for you. These are naturally gluten free when you use the right oats, are packed with some healthy fats from the ghee (I am basically eating my body weight in home-made ghee this pregnancy) and are sweeter with some coconut sugar – a slightly lower glycemic index than refined sugar with more nutrient too. I suppose these could be called ‘lactation cookies’ but I feel like that’s nonsense really (I mean it just an excuse to eat cookies right? )….but I will definitely have several batches of this dough sitting waiting in my freezer for after baby comes because I feel like they would make the perfect 4am feeding snack? If you don’t want to make your own ghee (cheapest options) you can buy it here. You can also use coconut oil instead of ghee which you can get here or melted butter. Also feel free to swap in choc chips for raisins as I imagine that would also taste awesome. Want a lower sugar version? Reduce the sugar or switch to xylitol (get it here) instead as this has less of an impact on your insulin and blood sugar. 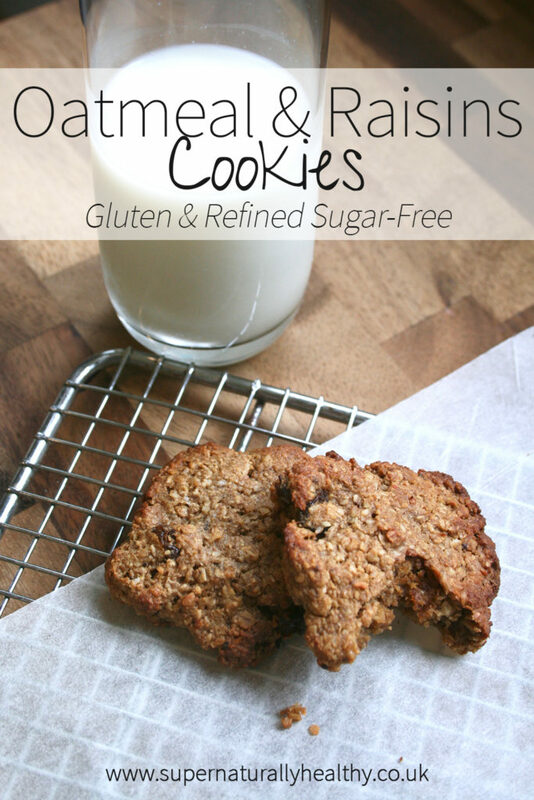 Gluten free and chewy cookies you can make in a huge batch or one at a time! Mix the oats, almond, coconut, salt, coconut sugar and baking powder in a bowl. Melt a jar of ghee then whisk into the eggs and nut butter - but make sure the ghee is NOT piping hot! Pour the wet ingredients into the dry ones and mix thoroughly. Add a small splash of milk if its too thick a dough. Place the dough in the fridge for 30-45 mins or over night. To cook scoop a heaped tbsp of the dough and place and shape onto a lined baking tray. You will need to shape and press the cookie flat is it won't spread much. Cook at 170c for 10 mins then increase temperature to 190c and cook for 3 minutes. Use a timer for this!! You can cook these all at once or just cook a few at a time and keep the dough covered int he fridge for 3-4 days or you can freeze the dough in a 'log/sausage' type shape and simply slice off a few raw cookies to cook. Feel free to use melted butter or coconut oil if you don't have ghee. Let me know if you make the recipe or any questions you have in the comments below!